The 20th Century gave us the Wright Brothers, the 747 and the Concorde. But it also gave us some of the strangest things ever to take to the skies. Here are some of the most insane aircraft ever conceived. 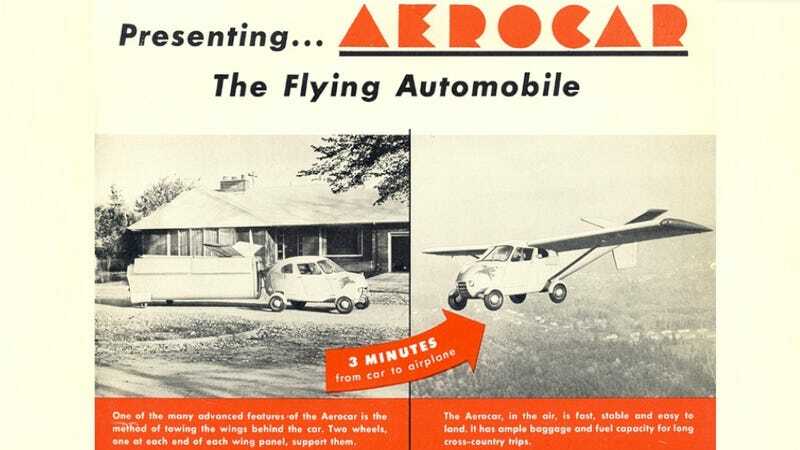 The Aerocar Model One was patented in 1956, had a 125 hp engine and a relaxing 100 mph cruising speed in the air. In 1971, the Soviet Kamov Design Bureau designed a foldable helicopter which could be transported inside a 50mm torpedo tube and be assembled in 15 minutes. It required a 40hp engine, which could fly the Ka-56 at a 70 mph (110 km/h) speed, but the engineers couldn't actually build the engine at such a small size. This VTOL or short take-off aircraft was built by the Ryan Aeronautical Company in 1958. It had 21 flights in 1958 and 1959, before it crashed. Later it was rebuilt with an open cockpit. The main rotor system, with a diameter of 134 feet (41 m), made the XH-17 "Flying Crane" capable of flying more than 50,000 pounds (23000 kg). It had the wheels of a B-25 Mitchell and a C-54 Skymaster, the fuel tank came from a B-29 Superfortress, the cockpit from a Waco CG-15 and the tail rotor from a Sikorsky H-19. Unfortunately the drive system wasn't efficient enough, and it limited the Flying Crane to a range of 40 miles (64 km). The famous aircraft builder Chance Vought built the first ever disc-form aircraft, the umbrellaplane, in 1911. It flew several times at Chicago's Cicero Field, according to contemporary sources. The first in a series of Arup planes was developed in South Bend, Indiana by Dr. Cloyd Snyder. It was called by Dirigiplane or the Snyder Gilder. The aircraft with a circular wing on top of the fuselage was designed by an aeronautical engineer named Stephen Paul Nemeth. The earlier version had 20 wings in a row and a tail for stability, but can't flight more than 50 ft. The 1907 model had 200 wings in four rows and a 22 hp engine with a 7 ft propeller. It achieved a 500 ft flight. The curved wings are lovely, but it never flew. The goal of a secret U.S military project was a fighter-like aircraft which could fly at extreme altitudes with a very high speed — but it had stability problems. Only two of them were built in 1958 and 1959, and the project was cancelled in 1961. It was built to be able to take-off from the water. The aircraft had 107 flights, (with a flight time of 103 hours) but after designer Robert Bartini's death the project was dropped. Now it's rusting in a Russian open-air museum.